Last edited by Ruffsta on Fri Feb 24, 2012 3:46 pm, edited 24 times in total. do u have any other plants besides veggetables ? yeah those are the same ones I'm talking about.. unfortunately i do not - i only grow vegetables... sorry. Ruffsta wrote: yeah those are the same ones I'm talking about.. unfortunately i do not - i only grow vegetables... sorry. do u live in rhode island? can you get me some of these? so do u want the lupini beans or not? sorry, been busy since my last login... but no, i am no longer interested - but i do appreciate the offer. Pepperoncini pepper I have six seeds left to trade out. I posted on here idk why you didn't see it. sorry, i thought i messaged you.. at the moment just possibly interested in your artichokes.. i'll have to look into artichokes a little more. That's fine I have the most seeds of them anyways. also, luria has taken the last of the mini bell pepper - item also removed from my list for now as well. ALL SEEDS HAVE BEEN SENT OUT AS OF THIS MORNING!!! thank you everyone for trading. 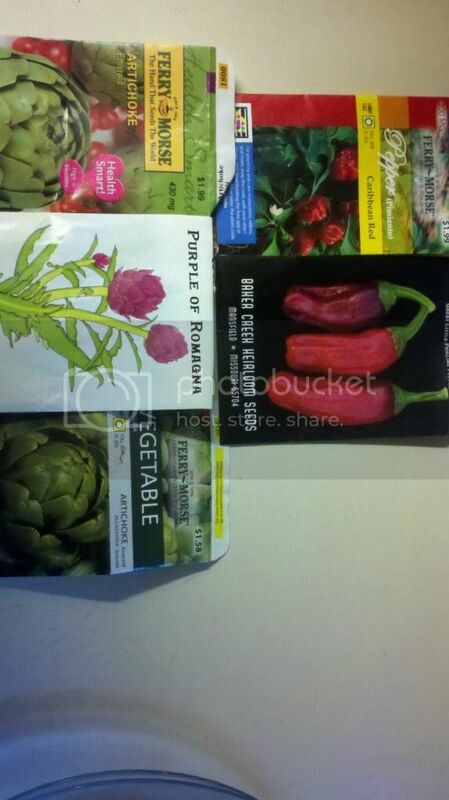 I told you I have 3 diffrent artichokes I must be invisable.